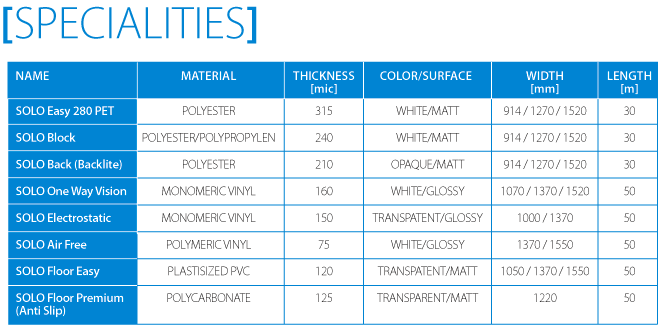 314µ polyester coated from one side with white matt surface. Perfect waterproof, high density and high resolution printing characteristics. High quality coating gives a sinificantly short drying time and brilliant true color reproduction. Designed to be highly resistant to solvent ink aggression during printing process and to guarantee very good printing performance on any solvent and eco-solvent based ink-jet printer. Particulary suitable for displays, posters, signs etc. 280µ polyester film with polypropylen lyner coated from one side with white matt surface. Blocking light feature allows to be used for display applications if it is necessaty not to pass light though. Perfect waterproof, high density and high resolution printing characteristics. High quality coating gives a sinificantly short drying time and brilliant true color reproduction. 210µ polyester film coated from one side with matt surface. Perfect waterproof, high density and high resolution printing characteristics. High quality coating gives a sinificantly short drying time and brilliant true color reproduction. One Way Vision Vinyl (white gloss, 160µ) with clear solvent based acrylic adhesive (permanent), laminated on a two-sided PE-coated silicone paper liner (140 gsm). The PVC offers a high dimensional stability and is suitable for apllications on flat glass surface. Especially designed for decoration of car windows, public vehicles windows and shop windows showing the printed surface outside but allowing a good see-trough from the inside. Once applied on glass, it can be removed without leaving adhesive residues. Monomeric, electrostatic PVC (transparent gloss, 150µ) laminated on a one-sided PE-pasteboard liner (180 gsm). The PVC offers a high dimensional stability. Especially designed for short-term window decoration. Polymeric PVC (white gloss, 75µ) with grey-coloured micro-struc-tured solvent based acrylic adhesive (permanent), laminated on a two-sided PE-coated mbossed silicone paper liner (160 gsm). Particulary suitable for application on flat, curved and slightly corrugated surfaces. No adhesive residue after removal, if correctly applied. Monomeric PVC (embossed, transparent matt, 120µ) with a clear solvent based acrylic adhesive (permanent), laminated on two-sided PE-coated silicone paper liner (150 gsm). The PVC offers an excellent dimensional stability. Application: Especially designed for floorgraphic applications with anti-slippery character and scratch resistant surface for mid-term floor decoration and advertising (airports, railway stations, shopping centers). Embossed polycarbonate (transparent matt, 125µ) with a clear solvent based acrylic adhesive (permanent), laminated on a siliconized polyester liner (50µ). Especially designed for floorgraphic applications with anti-slippery character and scratch resistant surface for mid-to-long-term floor decoration and advertising (airports, railway stations, shopping centers).